Many children feel that the call to go to bed is the final punishment for the day. As parents we think of sleep as a natural part of the day – just like having breakfast, lunch and dinner. Taking the time to explain to your toddler why it is important to sleep, might just give you as a parent a better quality of sleep as well. Explain to your child that sleeping is important to help their brains to remember what they learn . Enough sleep improves concentration and attention span . Sleep helps with problem solving skills . The body needs sleep for the muscles, bones and skin to grow . Enough sleeps improves the body’s ability to fix injuries , stay healthy and fight any germs attacking the body. If your child struggles to sleep, make sure the bedroom is cool, dark and quiet. Any light in the room for example at TV or computer might disturb your child’s sleep. A dim nightlight might provide enough comfort without preventing restful sleep. It is useful for your child’s body to become familiar with a bedtime routine. Going to bed at the same time every night and having a bedtime routine set (brushing teeth, using the toilet and listening to a story) will assist in the process of getting enough sleep. Make sure that your child does not have any caffeine drinks in the afternoon or at nighttime. A big meal just before bedtime might make your child feel uncomfortable and prevent them from falling asleep. Rather give a glass of hot milk and a small healthy snack if required. Enough exercise during the day will tire your child and make going to bed easier. As parents it is our responsibility to ensure that our children get enough and uninterrupted sleep. Make sure that your child get the right amount of naps during the day at the right times. 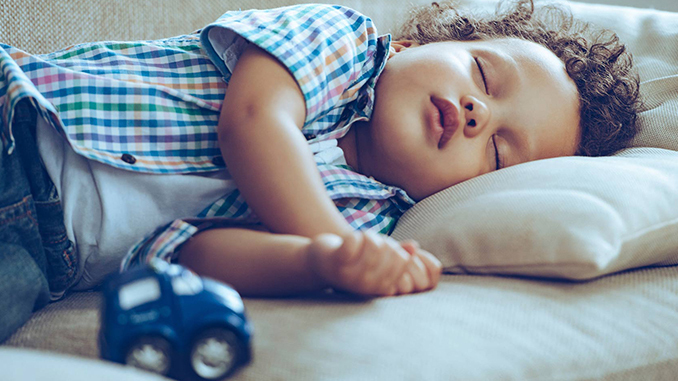 When you have your child’s sleep schedule set, both of you will reap the benefits. A well-rested child has the ability to concentrate better and therefore will find classes easier and less stressful. Children who had a good night’s rest are more sociable and less grumpy than their counterparts who might appear hyperactive, irritated and tearful. Being able to better problem-solve will provide a sense of achievement, which in turns builds self-esteem and confidence. These children will be more immune to opportunistic germs and be able to more active during the day. Probably the biggest advantage from a parent’s point of view is that you will also be able to have higher quality and quantity of sleep!